COLWOOD, BC —​ Colwood Corners was bustling with activity on Thursday afternoon as Onni Group hosted Mayor Carol Hamilton, members of Colwood Council, and other community leaders to celebrate the start of construction on new buildings on the site. 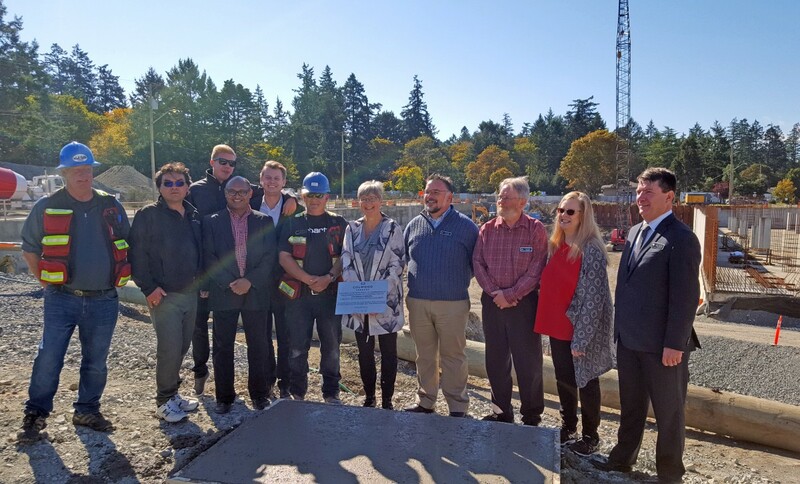 Dignitaries participated in a ceremonial concrete pour and placed a commemorative plaque into the concrete to mark this milestone for Colwood. Onni plans to transform Colwood’s town centre with six new buildings in this first phase, providing more than 400 apartments and over 15,000 square metres of commercial space for new shops, services, and eateries. Construction is set to begin on the first mixed-use building at the corner of Sooke Road and Colwood Crescent in the fall of this year, followed by two mixed-use residential buildings, according to Rodney Rao, manager of development at Onni Group. Full build out of the first buildings is estimated for 2020. Pedestrian friendly walkways will frame a central plaza and children’s play area to create a lively and welcoming gathering place complete with trees, landscaping, outdoor seating, lighting, and public art. Bike lanes and a landscaped boulevard will be added on Sooke Road along the front of the development, and a connection to the Galloping Goose Regional Trail that runs along the property will make it easy for people to visit the site on foot or by bicycle. Colwood’s new Official Community Plan encourages development in town centres at Colwood Corners, along the Sooke Road transit corridor, and in a new seaside village at Royal Bay.